Spring may be here but over the next few days, it will feel more like winter as a bitterly cold Scandinavian front moves in. 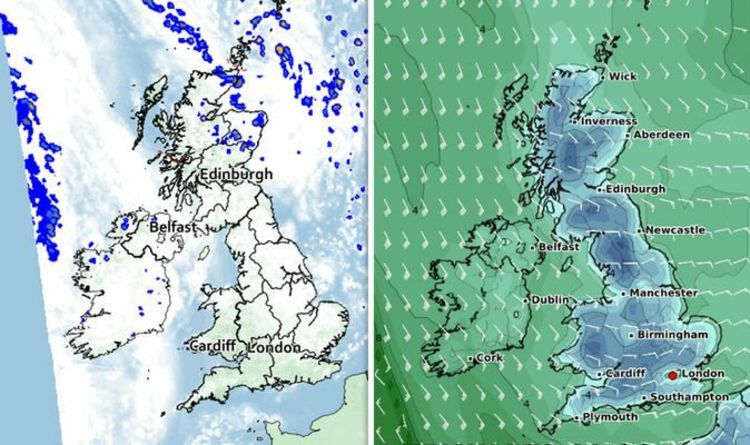 The Met Office says the winds mean it will turn cold for the eastern side of the country, although a band of high pressure will offer respite in the west. By Friday, there will be thicker cloud, rain and tumbling temperatures in the single-digit figures. The current Met Office weather outlook for Friday to Sunday reads: “Cold, with widespread frost at night. Largely dry and sunny by day, though turning cloudier by Sunday. Meteorologist Aiden McGovern also warned in his Met Office week-long forecast that “it is going to feel cold again around eastern areas” by tomorrow. He added: “Now into this weekend, these weather fronts will try to move in from the west but they are blocked by high pressure and that means there is a chance of cloudier skies and some rain for Northern Ireland at times into the weekend. “I suspect largely it will be held back, this high pressure will muscle its way in across the UK bringing mostly dry weather through Saturday and Sunday. “But again that breeze from the east will make it feel cold. “The jet stream still a mess heading into the weekend, thoroughly contorted around the UK and that tends to mean it is not going to be very effective at bringing in areas of low pressure so for most, high pressure remaining into the weekend. The mercury will hit daytime highs of 7C in Aberdeen and 9C in Southampton. But come nightfall, the widespread frost will see the mercury plummet to freezing and below. A WXChart map shows the cold could reach -7C for many people on Sunday. The Met Office has predicted the cold weather will continue as we head towards Easter although it is less certain at the moment. But the bookies are betting on snow and a White Easter, with Coral offering a 5/4 chance of it snowing in any major city over the Easter weekend. The bookmaker is also offering odds of 11/8 (down from 2/1) on it being the coldest April yet. Coral's Harry Aitkenhead said: “We are used to offering and taking bets on a White Christmas but this time around it's very much a White Easter that looks on the cards. The Met Office added: "For Easters which fall late in April, up to 14 hours of sunshine has been recorded in some locations across the UK."